I'm being so good. The UPS man just brought a box labeled "Stampin' Up!" that I know contains wonderful goodies like the Medallion stamp and my vanilla hodgepodge hardware set. I'm being good because I refuse to let myself open it until I finish this post. So let's hurry. Here is a card I made this weekend. I was trying a resist technique I read about on another blog but I had trouble getting the image to resist - my ink dried on the vellum too fast. Should I have spritzed it with water or the stamp with water? The lesson here is read more carefully or take notes. 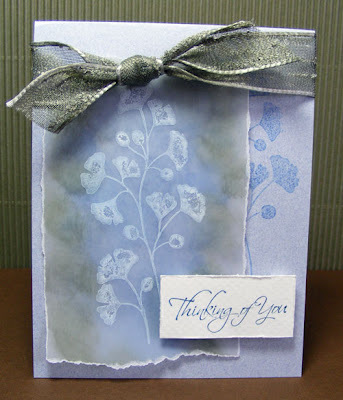 Anyway, what I did to salvage my efforts was to stamp the floral design in Whisper White over the sponged vellum. Whisper White takes a long time to dry so I let these sit overnight.